The 11th Asia Lighting Conference (ALC), which is jointly sponsored by the China Illuminating Engineering Society (CIES), the Illuminating Engineering Institute of Japan (IEIJ) and the Korean Institute of Illuminating and Electrical Installation Engineers (KIIEE), will be held in Kobe University, Kobe, Japan, from 13 to 14 September 2018. ALC is an international academic conference on science and art in the field of lighting. It aims to promote academic exchanges and technological innovation among science and technology personnel in Asia, especially among young scholars, through research exchange, discussions, and learning from each other. The theme of this session is "The LED age: Challenge from Asia", which is divided into keynote speech, invitation talk, oral presentation, short oral presentation and posters. The conference also has a workshop session for discussions on hot topics. We have provided the opportunities to exchange valuable information among delegates and to foster young lighting engineers in the ALCs for 10 years. The 11th ALC will be held at Kobe University, Rokko Campus for two days. ALC was formerly known as the Lighting Conference of China, Japan and Korea. The 11th ALC will become the first conference after the title of conference was changed. In the conference whose theme is “The LED age: Challenge from Asia”, we plant hope the delegates to enthusiastically discuss strategies to perform basic and applied studies on LEDs, which infiltrate various markets in Asian countries. Kobe is an attractive city to visit. It has an international trading port, intriguing buildings and a breathtaking nightscape. Let you enjoy sightseeing there, before and after the conference. Asian countries occupy the important positions in lighting engineering. New LED technologies have been developed in many research laboratories in Asia. In addition, countless LED-equipped products are produced in factories there. Asia is expected to send much information on this technology to the world. In the 11th ALC, we will start to issue design awards, and expect lighting and product designers to participate in the conference. We also hope many scientists, engineers and students who are involved in lighting technology to join it as well as submit their manuscripts to us. Improve lighting environments in China, Japan and Korea, as well as other countries in Asia and around the world. Contribute to lighting research, technology and industries in Asia. Motivate young lighting scientists, engineers as well as designers in Asia and encourage their participation in the conference. Establish joint study programs among the Parties. Encourage co-operation with other international lighting organizations. The poster size for each paper is 1189 mm (height) x 841 mm (width). Posters should be displayed on boards during the whole Poster session. The paper should be written in English, with a maximum length of 2-4 pages in A4 size. At the same time as registering, Abstracts should be submitted to the website of the conference, before the deadline: May 31, 2018 (Thursday); 500 words or less. The organizer will inform the author on June 15, 2018 (Friday) on the decision of acceptance or not. The full paper should be submitted to the conference home page, before the deadline: July 27, 2018 (Friday). The abstract and the full paper shall be submitted in the form of a template provided by the meeting, and the form of publication shall be selected by the author, for the decision of the paper review committee. The conference will recognize outstanding papers. The composition of the paper committee, all of the submitted papers for a unified review, The following awards are given. Note: Cash payment on site; can be paid in JPY. Students' Workshop "Let's make connections across countries"
As a place of communication for students from each country, we will implement a plan management program by students. This is our first attempt. Participants are students, but please do not hesitate to visit us when entering or leaving the venue. Benefits: Priority participation of optional tour "Kobe Lamp Museum"
An optional tour will be held from the evening of the first day. Admission free. A nonstop bus to venue will be operated. Please offer at the reception desk. Take JR (Japan Railways) Kansai Airport Line from “Kansai Airport” station and get off at “Osaka” station (time required: 1 hour). 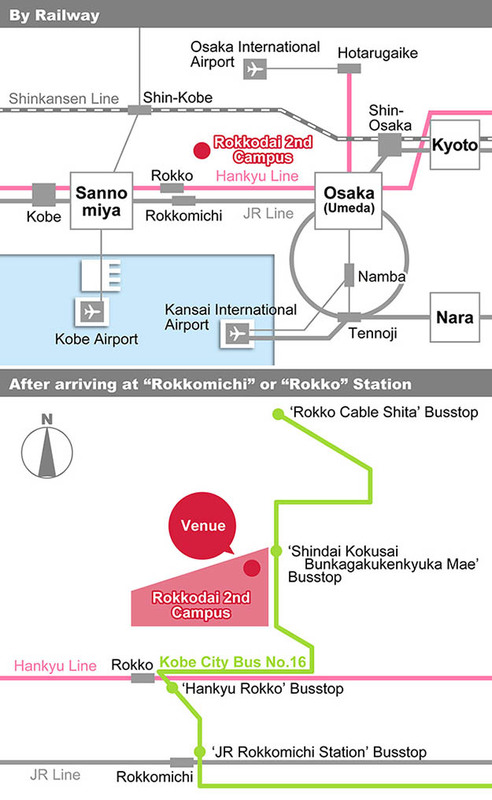 Change to JR Kobe Line and get off at “Rokkomichi” station (5th station by express train, time required: 25 min./ fare: JPY 1,660). When taking a train from "Kansai Airport," go up to the second floor of the passenger terminal building and go through the passage to the concourse. Take the Limousine Bus bound for “Kobe Sannomiya” from Kansai International Airport (time required: 65 min./ fare: JPY 1,800). At “Sannomiya,” go to Hankyu Railways and get onto the Kobe Line concourse bound for “Umeda.” Take the local train to “Rokko” station (3rd stop, time required: 6 min./ fare: JPY 180). How to use the limousine bus: go out of the passenger terminal building and buy a ticket for "Kobe Sannomiya" at the ticket counter; board the bus at No. 6 bus stop. Take MK “Skygateshuttle” to your destination in Chuo-ku, Higashinada-ku, Nada-ku, Hyogo-ku in Kobe city from Kansai International Airport (fare: JPY 2,300, one-way/per person). Reservation by phone or by web is required up to 2 days prior to the date of use. When using the MK "Skygateshuttle" omnibus, go to the MK counter on the first floor of the passenger terminal. Take Kobe City Bus No. 16 at bus stop ‘JR Rokkomichi Station’ or ‘Hankyu Rokko’ and get off at bus stop ‘Shindai Kokusai Bunkagakukenkyuka Mae’ (time required: 12 min./ fare: JPY 210). Copyright (c) 2005 - 2018 The Illuminating Engineering Institute of Japan. All rights reserved.